For those of you who haven't had the chance to check it out, here's an in-depth look at the key features that help you ace your job on the go. After logging in, you're taken to the Recruiter Mobile homepage, where the updates stream provides you with the latest information on candidates you follow. For example, if a candidate edits their profile or if someone on your recruiting team takes an action on a candidate follow, you’ll see it in your updates stream. Updates will also highlight new applicants for jobs you posted, new results for saved searches and new hiring manager reviews. Now let's say you're interested in your new job applicant named John, and decide to view his profile. 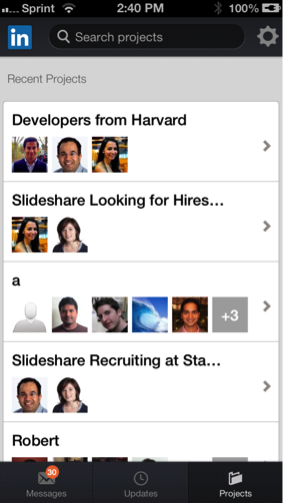 Browsing candidate profiles in Recruiter Mobile can help you gauge a candidate's fit for a job you posted. 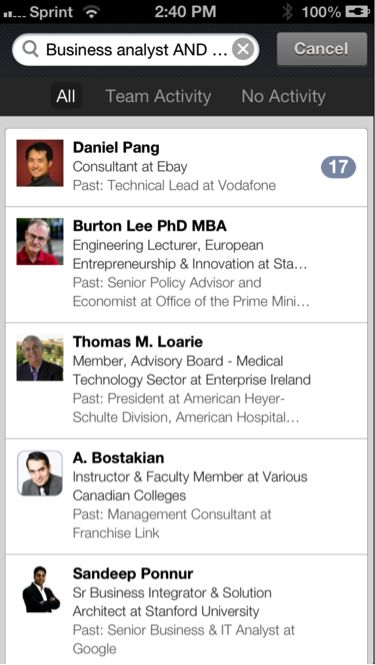 The top card gives you a quick summary of their current role -- name, headline, location and industry. The Team Activity section (pictured below) lets you know if anyone on your recruiting team has already evaluated the candidate for another job. 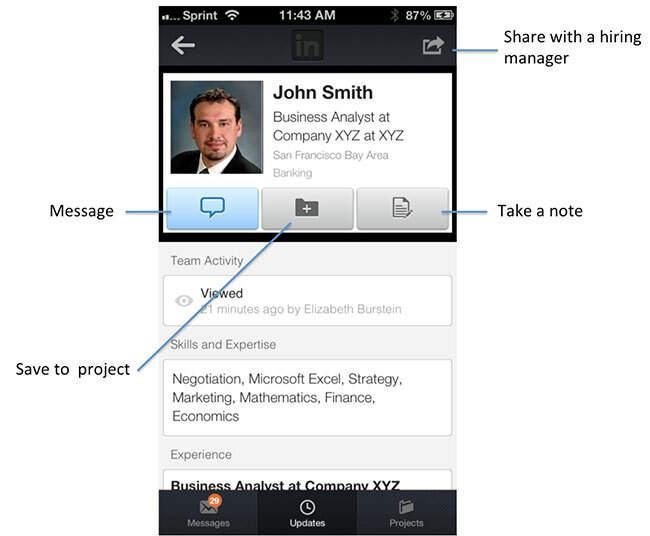 Under this, you can see the LinkedIn.com profile sections, optimally ordered for your recruiting needs. John looks like a great fit for my Business Analyst role, so let's contact him. When you click on the message button, you have up to four options for communicating with your candidate -- InMail, email, call and text*. 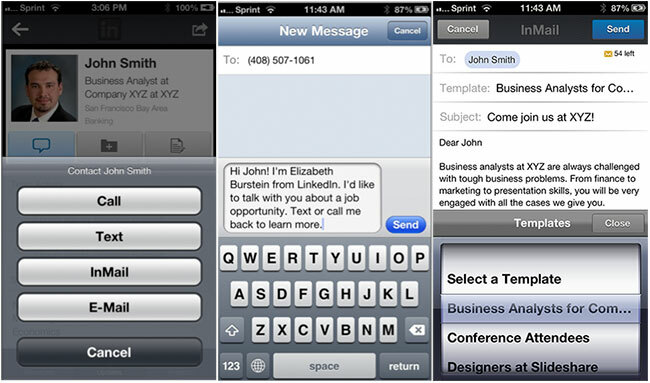 Texting an introductory message or InMailing a long “sell” message is challenging on a smartphone. So, we provide templates you can customize in Settings. Let's go ahead and use our Business Analyst template to send John an InMail. 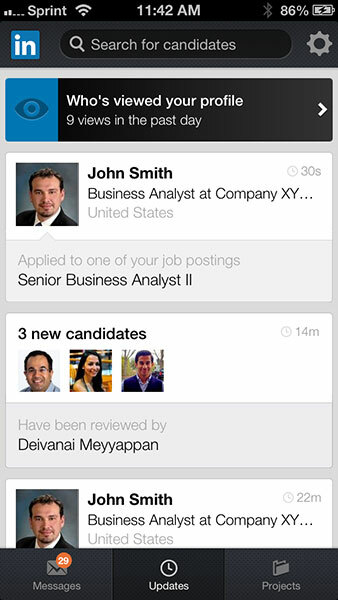 When a candidate like John replies, you’ll immediately receive a push notification. So you’ll be in the know regardless of whether you’re at the gym, commuting into work or at the coffee shop. Now that I know John wants a follow-up in two weeks, I’ll save his profile alongside other Business Analyst prospects. Projects help you keep your candidates organized. They also makes it easy to access candidates from your smartphone, tablet, laptop or desktop. If, like John, a candidate isn’t ready to engage just yet, you can use the Search feature to find more relevant prospects. Let's say you're hiring for Business Analysts with degrees from great schools in California. Boolean operators work just as well on mobile as they do on desktop, so you can search "Business Analyst AND (Stanford OR Berkeley OR California Institute of Technology)." Search results are organized in three tabs -- "All," "Team Activity" and "No Activity." The second and third tabs help you filter prospects your team hasn’t acted on from profiles that your team has already acted on (for example, already InMailed that prospect, or shared their profile with the hiring manager). In the "All" and "Team Activity" tabs, the number on the right gives a quick count of the total number of actions that your team has acted on. Since we’re interested in brand new Business Analysts, let's go ahead and look at profiles in the "No Activity" section. William appears relevant, so let's check out his profile. Note that the carousel up top helps easily scroll through profiles, which saves time since you don't have toggle back and forth between individual profiles and the list of search results. After digging deeper into William’s profile, I’m on the fence about whether or not he’s a good fit. So, I’m going to share his profile with the hiring manager, Sarah, simply by tapping the "share" icon, typing Sarah’s name, and hitting "send." 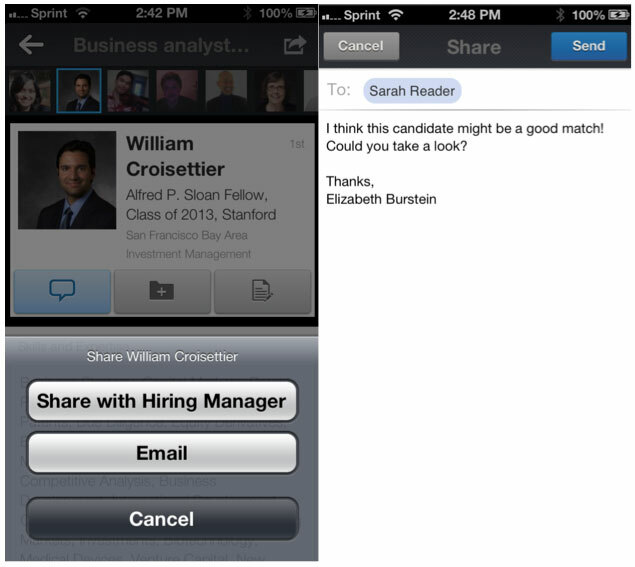 The hiring manager review process is also simplified on mobile to improve communications between recruiters and hiring managers. Sarah opens her inbox, votes "Great," and writes a quick comment to better inform the recruiter. We couldn’t agree more. But don’t take her word for it, try it out for yourself! You can download it from the App Store if you’re an iPhone user. 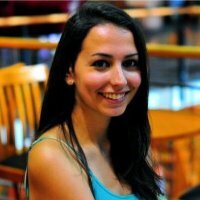 If not, you can access it from your mobile device’s web browser at www.linkedIn.com/recruiter.